An amazing book of shadows, totally handmade and made to order. The book was ealized with a particularly coating based on paper, resistant to water and it is like the cloth ( the same coating is used to make wallet, belts, tags and more ). No leather. Totally VEGAN. 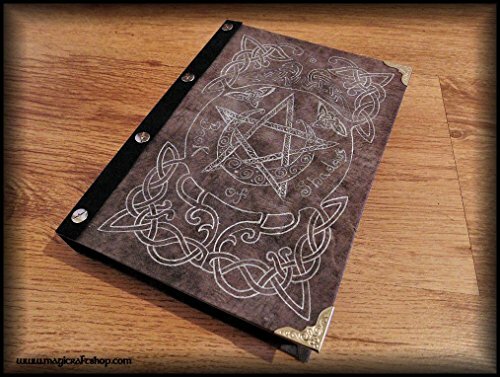 Cover is in grey color with light shades, with silver decorations on it, painted by hand, two decorative metal corners, black rib with "book of shadows" written, painted by hand. The book is with screws, in this way you can add and remove the pages as you wish. SOFT COVER. Medium size: 22x16 cm. 500 ivory pages with aged edges inside the book. The book is ready to be shipped, in 5 days and it will be shipped from UK. If you have any questions about this product by MagiCraftShop UK, contact us by completing and submitting the form below. If you are looking for a specif part number, please include it with your message. Elegant handmade book, case-bound, with raised bands, in wood and black leather. Journal, blank book, diary, sketchbook.